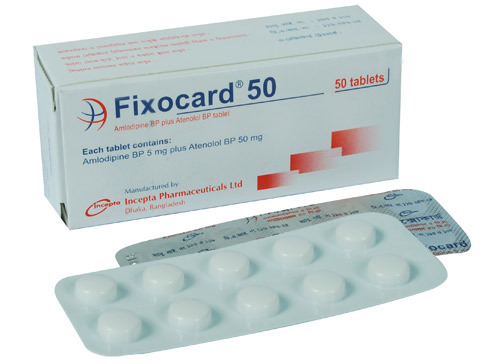 Fixocard 50 tablet: Each tablet contains Amlodipine Besilate BP equivalent to Amlodipine 5 mg and Atenolol BP 50 mg.
Fixocard 25 tablet: Each tablet contains Amlodipine Besilate BP equivalent to Amlodipine 5 mg and Atenolol BP 25 mg.
Fixocard is a fixed-dose combination of Amlodipine and Atenolol. Amlodipine is a dihydropyridine calcium antagonist that inhibits the transmembrane influx of calcium ions into vascular smooth muscle and cardiac muscle; it has a greater effect on vascular smooth muscle than on cardiac muscle. Amlodipine is a peripheral vasodilator that acts directly on vascular smooth muscle to cause a reduction in peripheral vascular resistance and reduction in blood pressure. Amlodipine reduces tone, decreases coronary vasoreactivity and lowers cardiac demand by reducing after load. Atenolol is a cardio selective beta-blocker. The cardio-selectivity is dose-related. Atenolol causes a reduction in blood pressure by lowering cardiac output, decreasing the plasma renin activity and sympathetic outflow from CNS. Atenolol also causes a reduction in myocardial oxygen demand by virtue of its negative inotropic and negative chronotropic effects. 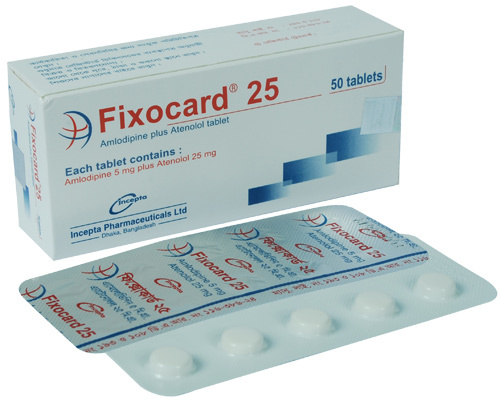 The recommended dosage is Fixocard or Fixocard 25 one tablet daily. If necessary, the dosage may be increased to two tablets daily or as advised by the physicians. The dosage however should be individualized. The combination of Amlodipine and Atenolol is well tolerated. Overall side-effects include fatigue, headache, edema, nausea drowsiness, anxiety and depression. Drug withdrawal: Since coronary heart disease may exist without being recognized, patients should be warned against stopping the drug suddenly. Any discontinuation should be gradual and under observation. Nursing Mother: The combination should not be used by nursing mothers. If its use is considered necessary, breast-feeding should be stopped.